railway hotels, converted train carriages, restored station buildings and B&Bs, guest houses and self catering accommodation with strong train/rail themes. 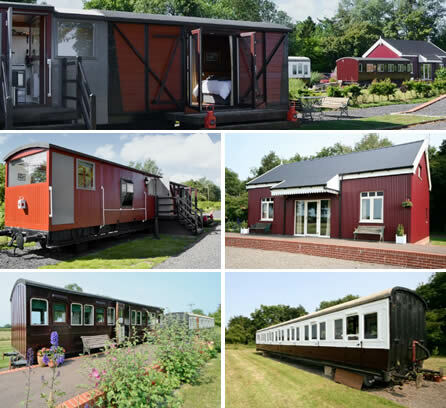 A range of unique self-catering holiday properties in converted railway carriages and former station buildings. You'll find several steam railway related holiday homes on this two-acre site, all lovely homely conversions full of train and railway character, well-equipped and including the use of a shared pool, hot tub and garden. Converted 1957 railway carriage in a quiet setting on the site of an old siding at the former Bridge of Dee station. The accommodation is all ground floor and is made up of a living room/kitchen, two en-suite double bedrooms and one 2ft 6in bunk room for children. Beautifully presented holiday accommodation within the, Grade II listed, former Castle Howard Station, in an area of outstanding natural beauty. This holiday home provides a modern, ground-floor, self-contained apartment with one double bedroom and a comfortable sofa-bed in the lounge, if required. The station is on the Scarborough/York main line with occasional passing trains. A unique holiday home located next to Aberystwyth cliff railway, use the free passes provided for endless trips to the top of of the hill! The apartment is above the ticket office and station of the longest funicular electric cliff railway in Britain. It's at the north end of Aberystwyth promenade. This comfortable apartment has sea views from the kitchen and views over the railway from the guest bedrooms. On the famous Settle/Carlisle line, Dent Station is the highest mainline station in England. The renovated, Grade II listed, station buildings are now a comfortable holiday cottage with modern amenities. It can accommodate up to 6 in 3 bedrooms and also offers a large lounge and kitchen/dining area in the former waiting rooms. Stylish railway carriage conversion with a light and airy, modern, look. It offers and open-plan kitchen/dining area, a comfortable lounge with woodburner, a family bathroom, a double bedroom and a second bedroom with a single cabin bed, which can be converted to a double, for outdoor living there are decked areas both sides of the carriage. The Sleeping Car at Glenfinnan Railway Station is a superb base for exploring the mountains and glens of Lochaber, Moidart and Ardgour. The old carriage has been converted into unique and comfortable bunk accommodation for up to 10 people. A former steam train guard's van and box wagon converted to self-catering holiday accommodation, offering two comfortable bedrooms for four. For train lovers, it's located within short walking distance of the Mid Suffolk Railway Museum, which runs steam trains on summer weekends. The Station Cottage at Grosmont and two converted train carriages, Goathland Camping Coach and Levisham Camping Coach offer self-catering holiday accommodation at stations on the heritage North Yorkshire Moors Railway. All holidays include unlimited travel on the heritage train services. B&B in a converted railway station and carriages, offering two rooms in the old station house and six in luxurious Edwardian Pullman carriages. All rooms are en-suite. The guest lounge/breakfast room is in the former booking hall with its vaulted ceiling and ticket windows. Winner of many awards this makes an excellent destination for a romantic weekend or for train lovers. A tasteful conversion of the old Victorian station next to the platform at Newtonmore, a highly scenic line serving the Inverness to Perth/Edinburgh route. This quirky property retains many of its distinctive original features and has been decorated to a very high standard. It sleeps up to six guests in three bedrooms. A dinky little holiday cottage for two at the foot of Snowdon. The cottage was formerly a station on the famous Welsh Highland Railway from Caernarfon to Porthmadog (now running as a narrow gauge heritage railway). The cottage now provides comfortable accommodation for two, with all modern facilities. An utterly unique and rather special holiday home for railway enthusiasts and anyone seeking something a little different from a holiday home. This unusual property was newly built in 2004, but created in the form of a railway signal box. It's located next to the station in the Badenoch & Strathspey village of Newtonmore. 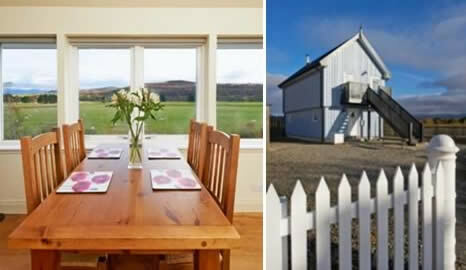 This 1 bedroom cottage uses an upside-down layout, making the most of the panoramic views of the Cairngorms and River Spey. On the upper level is a spacious, open-plan living area with log-burner and balcony, while on the ground floor is a double bedroom, bathroom and sauna – it has been decorated and furnished to a high standard. A single site containing a selection of several railway related holiday properties, including converted carriages, a guards van conversion and a station building, all restored and renovated to provide comfortable self-catering holiday accommodation. These are great as individual lets for four to six people, but are also ideal for a group or family break – by booking several properties on the same two-acre site, up to twenty guests could be accommodated. All these properties are well-equipped and include the use of a shared swimming pool, hot tub and garden. A fabulous destination for railway lovers, or as a romantic escape. This award-winning Colonial-style Railway Station conversion has two guest rooms in the former station house and six guest rooms in the luxurious Edwardian Pullman railway carriages. All rooms are en-suite with baths/showers, TV, and coffee/tea making facilities. There is a guest lounge is in the former booking hall with its high vaulted ceiling and ticket windows. Petworth is a centre for Antiques and is also a great base for touring and walking holidays. Most people agree that there's something rather special about trains, particularly steam trains, and holiday homes in renovated railway properties, or even converted carriages, appeals not just to dedicated train lovers and railway enthusiasts, but to anyone seeking somewhere a little different to stay. The Travel-Quest railway section lists holiday accommodation (self-catering, B&B, guest houses and hotels) in converted railway stations; their former ticket offices, waiting rooms and occasionally train and tram sheds. In railway signal boxes, which make neat cosy homes, often with an upside-down arrangement to make best use of the signal box windows. Also holiday accommodation in former train carriages, converted for self-catering or as B&B and hotel rooms. For enthusiasts we also list other train/railway related properties, including accommodation on heritage train lines, railway worker or station masters housing or station hotels with a train or railway theme. An article about the history of converted railway carriages from their origins as Camping Coaches in the 1930's to present day restorations or conversions. Including converted train carriages, railway cars, guard's vans and, in the US, copellas converted to holiday homes or B&B rooms. The travel-quest railway and train themed holiday accommodation section is for listing converted railway carriages and former railway buildings converted to holiday homes or used as bed and breakfast accommodation or within hotels and guest houses. See the definition at further up the page for more details.